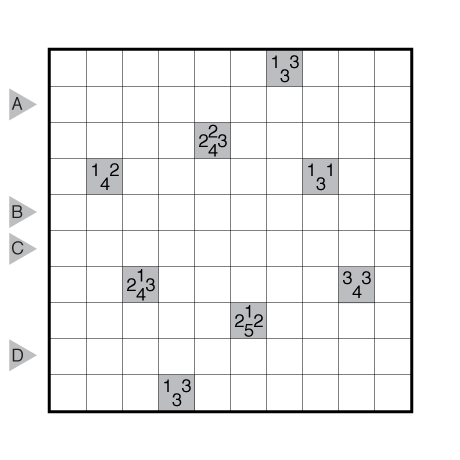 Author/Opus: This is the 3rd puzzle from guest contributor Yuki Kawabe. 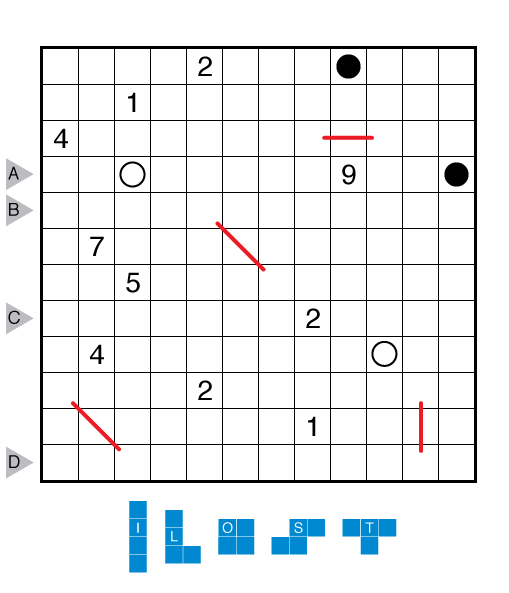 Rules: Combination of Sundoko, Snake, and Shape puzzle styles. Sundoko: Shade some cells to make sunglasses, consisting of a bridge (a given line, in red) and two lenses made out of orthogonally connected cells that are symmetric with respect to the perpendicular bisector of the bridge. Two lenses may not share an edge, but can intersect at a point. Cells with the bridges are not shaded, except at the bridge ends. 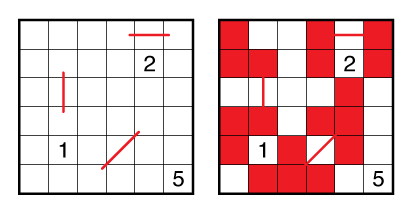 Numbers in the grid are unshaded, and indicate the total count of unshaded cells connected vertically and horizontally to the numbered cell, including the cell itself. Snake: Shade some cells to create a one-cell wide snake in the grid that does not cross or touch itself, not even diagonally. The snake starts and ends at the black circles and must pass through all white circles. 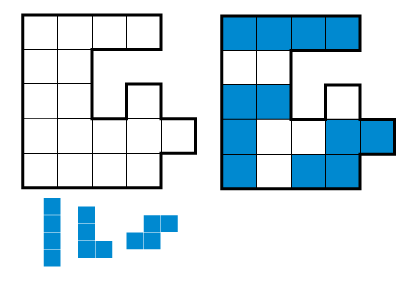 Shape: Place each of the given shapes into the grid exactly once (rotations and reflections allowed). Shapes cannot touch each other, not even diagonally. SSS: In SSS, shade some cells to make sunglasses, create a single snake, and place all of the shapes in the grid. Shaded cells of different categories (sunglasses, snake, shapes) cannot share an edge. Number clues referring to unshaded cell counts consider all three categories of objects as shaded cells in this hybrid. 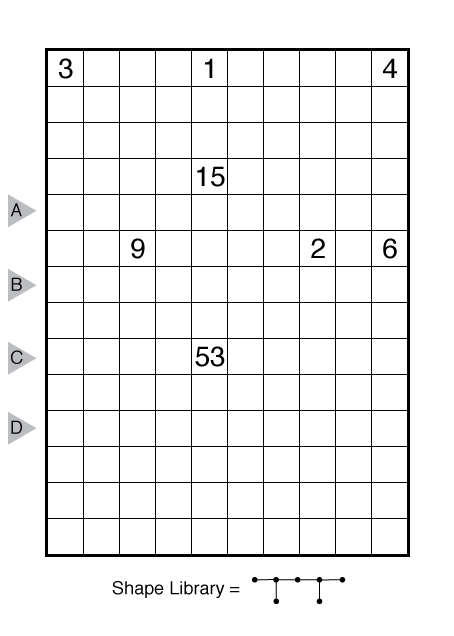 Answer String: Enter the length in cells of each of the shaded segments (sunglasses, snake, and shapes) from left to right for the marked rows, starting at the top. Separate each row’s entry from the next with a comma. 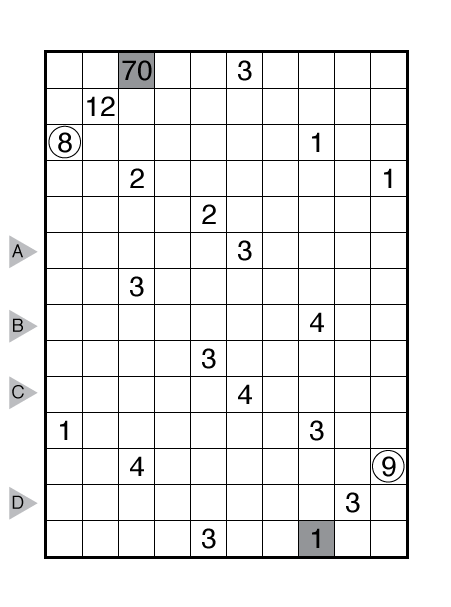 Author/Opus: This is the 2nd puzzle from guest contributor Yuki Kawabe. Author/Opus: This is the 44th puzzle from our contributing puzzlemaster John Bulten. 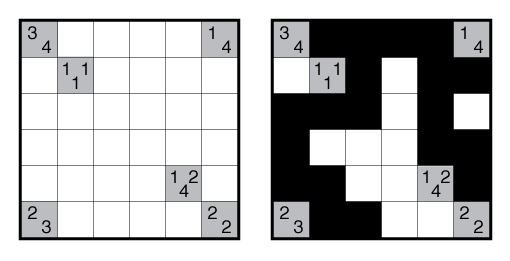 Rules: Shade some white cells black so that exactly one of the grid’s clues appears in each contiguous white or black region and indicates the clued region’s area. Circled numbers indicate cells that must remain white. Answer String: Enter the length in cells of each of the black segments from left to right for the marked rows. Separate each row’s entry from the next with a comma. Note: Light is John Bulten’s variation of the shading puzzle Light and Shadow, created by Serkan Yürekli. Unlike Light and Shadow, where all numbered cells start white or black, in Light puzzles the numbered cells that are not shaded or circled may be either white or black in the solution. Author/Opus: This is the 43rd puzzle from our contributing puzzlemaster John Bulten. 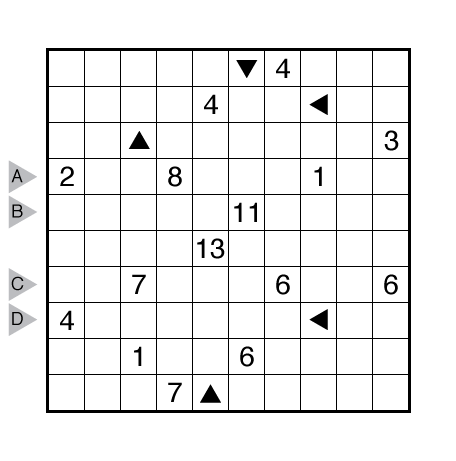 Rules: Shade some white cells black so that each contiguous white region is a valid Four Winds region (that is, the white region consists of at least two white cells, and has at most one “central” cell where both vertical and horizontal connections are made; if the white region contains a numeric clue, this clue must be the “central” cell and represent the count of all other cells in the region, which must be connected vertically or horizontally to this clue). An arrow clue must belong to a white region and point to its “central” cell (assignment of which cell is “central” is not necessary in one-cell-wide rectangular regions). The contiguous black regions can contain zero, one, or more clues. All clues inside a black region must indicate that region’s area. 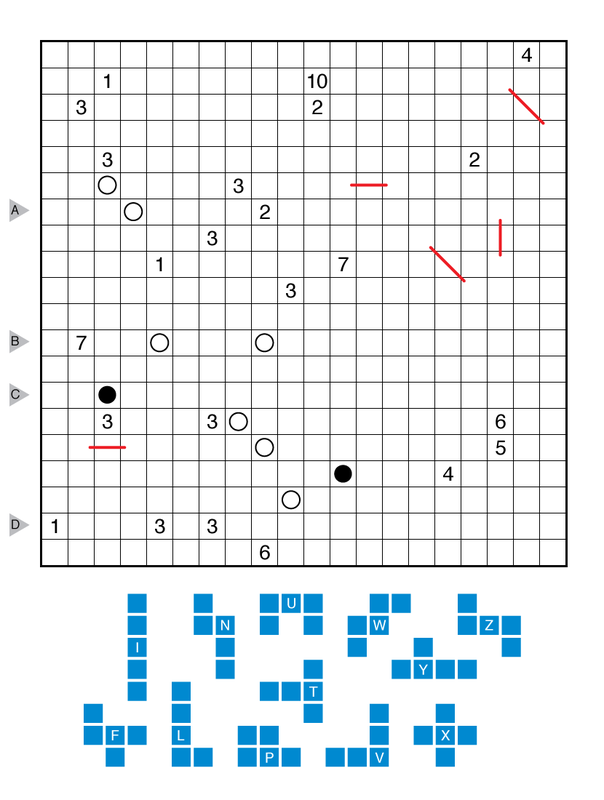 Note: Winddraughts is John Bulten’s variation on the puzzles Four Winds and Checkered Fillomino. Author/Opus: This is the 42nd puzzle from our contributing puzzlemaster John Bulten. 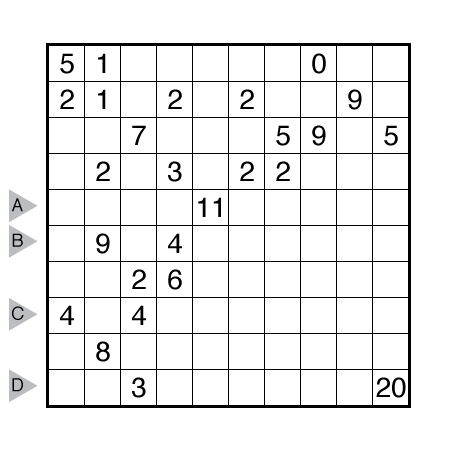 Rules: Shade some white cells black so that one of the grid’s clues in each contiguous white or black region indicates the clued region’s area. (Each contiguous region must therefore have at least one clue.) Any other clue in the region must indicate how many of the clued cell’s immediate neighbors are white (up to 9, including itself). Note: Turf is a shading puzzle created by John Bulten. We will have several more Turf puzzles from John in a few months when we start a new “Puzzlemasters’ Workshop” book series. Author/Opus: This is the 41st puzzle from our contributing puzzlemaster John Bulten. Rules: Shade some white cells black so that the grid is divided into white and black regions. Cells with numbers cannot be shaded. 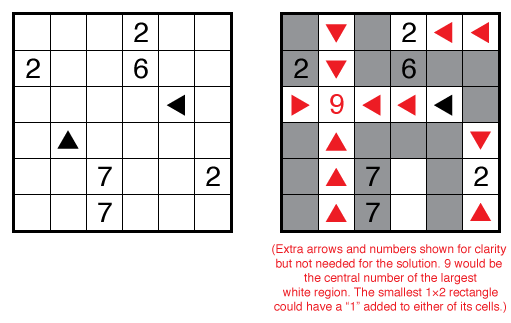 Each white region must contain exactly one number and have the same area in cells as that number. 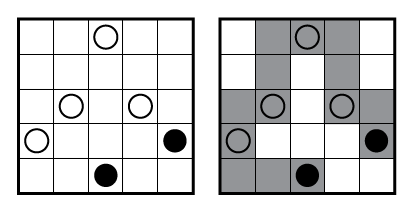 Two white or two black regions may only touch diagonally. 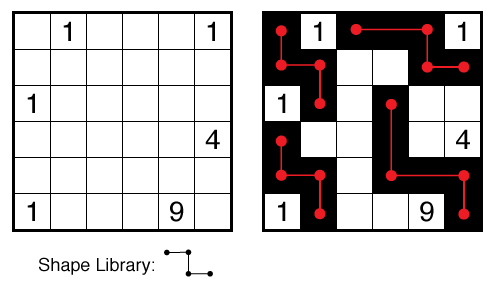 Each black region must be exactly specified by one shape graph given below the grid, where graph edges represent one-cell-wide straight paths with variable lengths, and graph nodes represent ends, turns, and branch points. Graphs can be rotated and reflected, and, if multiple graphs are given, not all need be used. Note: Surf is a shading/object placement puzzle created by Izak Bulten, which draws on elements from other shading puzzles like Nurikabe. We will have several more Surf puzzles from Izak and John Bulten in a few months when we start a new “Puzzlemasters’ Workshop” book series.